Michael Kuzilny is a criminal defense lawyer and former cop who has seen the worst that life has to offer. Twenty-five years ago, Michael learned what proved, literally, to be a life-saving skill. While other policemen were suffering traumatic stress, alcoholism, or suicide, Michael learned to practice meditation; and over two-and-a-half decades he has coached thousands of people inside and out of the criminal justice system to clear their minds, lower their stress, and bring the gift of their best selves to their family, friends, and life. 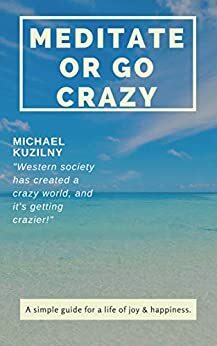 Michael says: "Western society has created a crazy world, and it's getting crazier! Over 40 million adults in the USA are diagnosed with some sort of anxiety disorder. A similar pattern is developing in most other western countries; I have not even mentioned other mental health conditions. Even children are not immune: anxiety, depression, and suicide rates are also soaring for the youth of today. It is extremely important to tame our turbulent minds every day, and it only takes 10 minutes!" Can you imagine if your world was filled with calm, happy people? How much more pleasant would that be for you? In Meditate or Go Crazy! Kuzilny encourages you to give the gift of stillness and a mind at peace to yourself and to those people closest to you. This is the shortest and simplest book you will ever find on meditation, and the great news is that it will make you happier, healthier, and younger. Transform your life: meditate, or go crazy! Michael Kuzilny is a successful Criminal Defence Lawyer, Author, TV presenter and success coach. A former policeman, Kuzilny has worked in the criminal justice system for over 30 years. He has dedicated his life to helping people through the tough times; and has a genuine passion to make a difference. He has shared his experiences and life lessons with millions of viewers on the National TV, and has spoken in front of large audience in virtually every major industry. 5.0 out of 5 starsThe best and simplest book on meditaton in the world ! Highly recommended ! I really loved this short book on meditation. I always thought my mind was too busy to meditate or read a book, but this book really changed my life. Having gone through a marriage break up and the loss of my business, I thought my life was spiraling out of control. I tried anti-depressants and going on holidays trying to spoil myself but nothing worked. I was down in the pits for the last 18 months. I purchased this book because I like short. I thought I will give it a go and see what this meditation everyone is speaking about is all about. Well let me say this very clearly. I have practiced the simple tips I got from this book and it has virtually changed every area of my life! I am feeling happier, and lighter and I don't seem to care too much about the past. I have found that this really worked for me, and friends and family have noticed that I am happier and much more content. 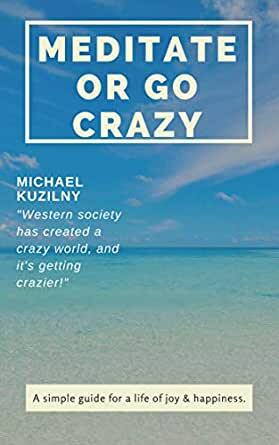 The author Michael Kuzilny is quite right, and he has certainly seen his fair share of people suffering. We are heading towards a stress epidemic and we need to really tame our turbulent minds on a daily basis. Please get of the drugs, the alcohol, the anti-depressants and read this book. If it worked for my stubborn and confused mind, it will work for you.